Use the form below to inquire about Jungle Lodge Near Corbett National Park . Use the form below to reserve for Jungle Lodge Near Corbett National Park . Discover your wild side at this Jungle Lodge near Corbett National Park with only the dense forest and a river for company. Located deep in the woods by the side of the Mandal River, this Jungle Lodge near Corbett National Park is in an area that was reclaimed from a village and where the forest has now taken over. The quiet in this little-explored part of the jungle is interrupted only by the chirping of birds and the call of wild animals. 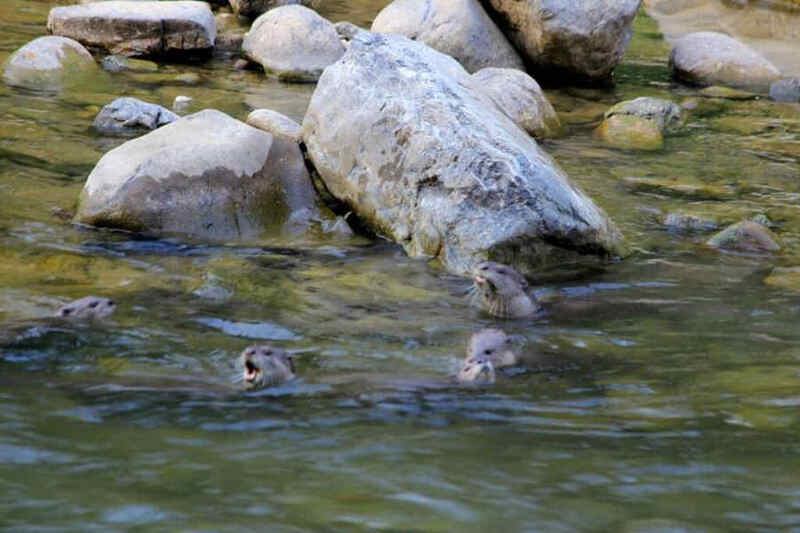 Accessible only by walking a short distance across the river on the Garhwal side of Corbett, the walk can turn into a 45 minute-long hike through the jungle when the water body is in full spate! In keeping with the promise of a true forest experience, this Jungle Lodge near Corbett National Park has no electricity supply. But this does not mean that you will have a hard time finding food and drink. Meals, snacks, and juices are all available on request whenever you feel the pangs of hunger. The property also has a couple of machans or watch towers from where you can indulge in wildlife spotting to your heart’s content. The lodge itself is a pre-fab structure equipped for a comfortable stay. Feel like a true forest-dweller as you warm yourself in the warmth of a bonfire under the starry skies. This Jungle Lodge near Corbett National Park has two rooms meant to be rented together, with a living room and a single shared bathroom. There is also a small kitchenette as well as a sit-out with place for a bonfire to be lit at night. The rooms can accommodate up to four people at a time with provisions to accommodate two children in addition. The term ‘communing with nature’ sure gets a whole new meaning at this lodge at the heart of the jungle! All meals, snacks, unlimited tea/coffee/non-packaged juices. Walks and treks around the property. Children up to 10 years stay free. The check-in and check-out time is 11 AM. Delayed check-ins and checks-outs are entertained, subject to availability of the room. Kids 10 years and younger can stay at the property free of cost considering one child accompanies one adult. Offers and special pricings are available for long stays and multi-week stays. Single occupancy is 65% of the double occupancy rate. If you cancel a confirmed booking up to 7 days prior to the date of check-in, 75% of the booking amount will be refunded. If you choose to cancel a confirmed booking up to 48 hours before the date of check-in, the refund will be 50% of the total booking amount. Any cancellations less than 48 hours prior to the date of check-in will not be refunded. Experience life in a village by tilling the land or harvesting the crop at the organic kitchen garden on the property or go cycling in the hills at your own pace. The vast jungle beckons you to explore when at Khetiyo. A walk in the forest or ‘Ghooming’ with a naturalist and local villager for company promises an unqiue experience. The area is also a bird watcher’s paradise with plenty of unusual species to be seen here. Star gazing and wildlife spotting at night from the comfort of a machan or watch tower is not to be missed while at this jungle lodge. Night vision equipment, comfortable bedding, and sandwiches will all be arranged to make it a night to remember! Hikes to nearby villages are great for half day trips and you can also choose to savour an authentic Garhwali lunch. If close encounters with the wild are what attract you, then you could go on a jeep safari into those parts of Corbett National Park where there is a higher probability of sighting the big cats. The Park is also home to herds of magnificent elephants. Jolly Grant Airport, Dehradun, is the nearest at a distance of about 180 km and Pantnagar Airport is 250 km away. Indira Gandhi International Airport, Delhi, is around 300 km away. Kotdwar has the closest railway station which is about 75 km away while Bijnor railway station is around 130 km from Khetiyo. New Delhi railway station is about 290 km away. Kotdwar is at a distance of around 75 km away while Meerut is around 200 km along NH34. The distance from Delhi via the Meerut Pauri National Highway is around 295 km.